“The Prime Minster survived the late-night confidence vote by just one vote, 151 voted “yes” opposed to 148 who voted “no”. 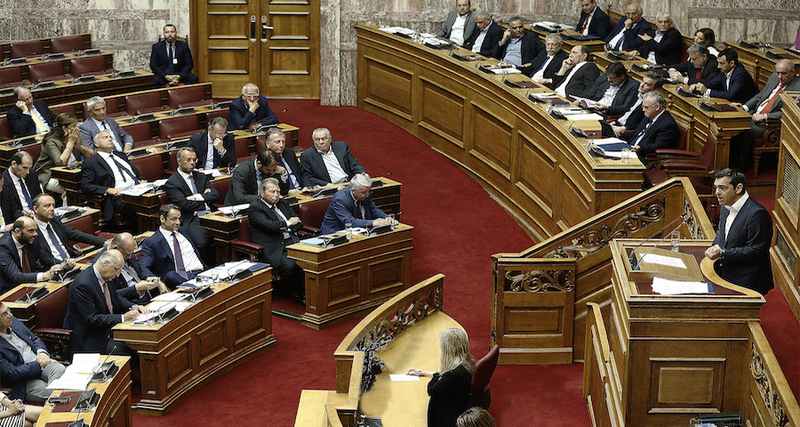 In an impassioned speech to Parliament on Tuesday, Prime Minister Tsipras appealed for a renewal of confidence, declaring that his administration had extracted Greece from its international bailouts and still had work to do. Tsipras has insisted that his minority government would remain in power until October, when its four-year term is due to end. My bolded portion above is referencing the fact that the unicameral Hellenic Parliament of 300 members acted as ‘the voters’. The leader of conservative New Democracy is a fierce opponent of the deal with FYROM (Former Yugoslavian Republic Of Macedonia) – at least, in his public speeches – and said that if ND comes to power it will renegotiate the Prespes Agreement. “The Prespes Agreement a(n) historic step” for both countries and its ratification is a “patriotic duty,” Prime Minister Alexis Tsipras said in an interview on Saturday, as the government tables the Agreement to the Greek Parliament and thousands of Greeks prepare for the big anti-Macedonia rally in Athens on Sunday. “As for the situation in the Balkans, a serious destabilizing factor there is the policy of the US and some other Western countries aimed at securing their dominance in the region,” he told the Serbian Vecernje Novosti newspaper in an interview published on the Kremlin website. The Balkans are often cast as a battleground between Eastern and Western powers, though all countries in the region aspire to join the European Union and most are already allied with NATO. However, Serbia, while also an EU candidate, remains a staunch Moscow ally and is set to welcome Putin with a parade on Thursday. The two countries share Slavic roots and the Orthodox Christian faith, which Putin described as their “spiritual and cultural kinship”. The US, a strong ally to Kosovo, has frequently accused Russia of meddling in the affairs of the region, including in last year’s referendum in FYROM to change its name, a prerequisite for joining NATO. Putin, however, accused the West of pressuring FYROM and Montenegro, a new NATO candidate, against the will of their people. The NATO expansion efforts are drawing “new dividing lines on the European continent,” he told the newspaper Politika. ‘Koutsoumbas: Under No Circumstances Will the KKE Vote for the Prespes Agreement’, idcommunism.com., Jan 12, 2010. Sorry, none of it will copy, but small wonder the KKE is against it. “The monks of Mount Athos, which is located on the Chalkidiki peninsula in Macedonia, northern Greece, issued a statement after their meeting expressing their unequivocal objection to the deal, which is expected to be debated in Greek parliament next week. “Protesters clashed with riot police outside Greece’s Parliament on Sunday afternoon, following a rally in Syntagma Square against the Prespa Agreement. “Before these (rock throwing) incidents, the rally against the Prespa Agreement was peaceful, with thousands of people attending, among which prominent members of the Greek opposition, such as the former Prime Minister, Antonis Samaras. On Jan. 15 school teachers protested new hiring procedures and ‘clashed’ with riot police. For background about more privatizations and Greeks bearing gifts, Son of Nato, etc., see my (cough) rather strident Feb. 2018 compilation here. 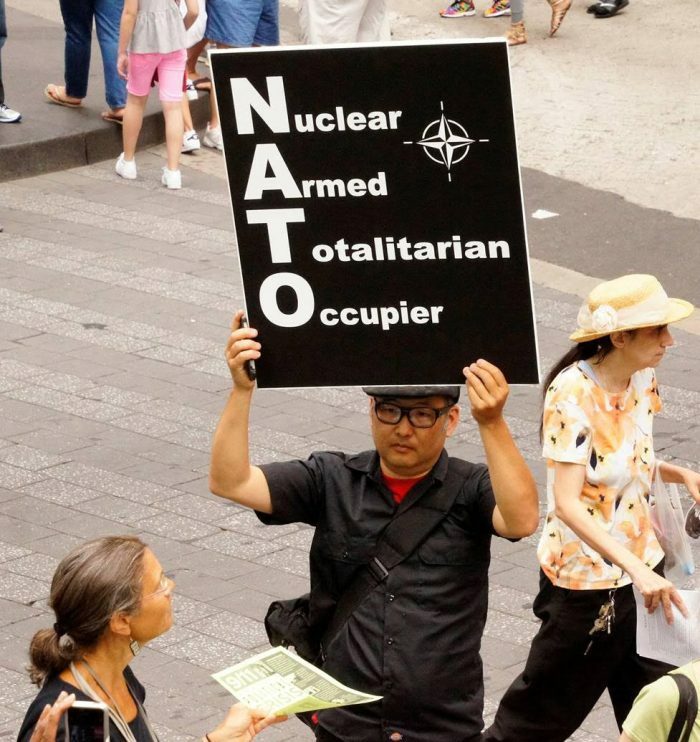 Now raw story had said that NATO had planned to hold the coming 70th anniversary in DeeCee, but canceled it…due to the anonymous military insiders who claimed that DT was still agitating to…get out of the Nato ‘peace organization’, as they call it. This entry was posted in africom, nato and tagged macedonian name change. Bookmark the permalink. no sound for me on the video, but oof! i don’t have the hour + to watch anyway, sorry U4j (wh?). did this diary cover enough, too much? and what’s going on in the streets now? Thank you for that, Unity. It clarified the historical issues, while being EU/Nato oriented, which some of the audience questions did probe. Some of the journalist’s comments about the EU not responding quick enough to the needs of the separate parts of Yugoslavia when it fell apart were interesting, and the country itself wanting to be called its historical name seems not really the issue – they have a socialist government and are Slavic. I’m still not clear why the Greeks would be protesting to the extent of almost unseating Tsipras. my read was that tsipras almost his confidence vote due to neoliberal austerity and resultant increased privatizations, not necessarily over the prespes agreement, but there may be a more direct relationship than i know. now as to ‘when yugoslavia fell’ i will say that alternate history may write it a but differently, as NATO repurposed bombed the bejayzus out of yugoslavia (bill clinton’s war) in 1999, and bombed bosnia and herzogovenia in 1994, neither was sanctioned by the UNSC. Nato had deemed it R2P, like libya. but yes, my understanding is that serbia was bombed because it was socialist/communist, which was the original reason for NATO. milosevic was pardoned of war crimes posthumously; iirc, he died in prison at the hague. but as to brady keiling’s calling the issue utter nonsense (yep, the video has sound today, i wifi glitch, methinks), i don’t see an american archeologist as arbiter of the issue, no matter his bonafides. the wiki entry on the Macedonia naming dispute issue is about 8 miles long, and excruciatingly complex. sorry i can’t pluck any section as key. but to me, the issues of those both in FRYOM and greece who object to the prespes agreement are a bit akin to the crimeans who speak russian, in effect are russian, and wanted to be ‘stolen’ by russia. i had read a good essay on those in n. macedonia who dislike being hemmed in by language, passport ID as ‘macedonian’, culture, religion, etc….but of course i hadn’t grabbed the link, dagnabbit. but as mr. wd hadn’t told me that he could hear keisling on the video, i bingled for his points, and kicked up a piece at neoskomos (h/t for the site U4J) noting that he’d been at the protests, and while he hadn’t ‘taken the pulse of the crowds’, only spoke of the black bloc-ish protestors and one who’d dorpped his drawers to wag his junk at the pop-po. so yes, i get where keiling stands on the issue and the protests. At the time of the Indignados we stayed away from the big Athens rallies where today’s SYRIZA politicians, or some of them, made a name for themselves. At least in little Aegina one knew who everyone was so provocateurs had less cover. The Gilets Jaunes are altogether less unpromising so far than these familiar outbursts against one of Tsipras’ possible positive achievements. We do not have an oversupply of them. Later for NATO. ah, given that you’d provided the video, i’d had to assume that passage of the prespes agreement is one of tsipras’s ‘possible positive achievements’. and a military alliance with netenyahu similarly? but my stars, two things: i’d forgotten that you’re on aegina; how gorgeous, lush, and such a long history and deep culture! and also, your command of english is breath-taking, WH. nato had 29 members as of jan. 1, 2018, with a number of new ones, and ones under their umbrella, aspiring nato, etc. : ukraine, georgia, colombia (s. america) it IS the military arm of the american hegemonic empire, sadly. Just to say also, I have no idea what Mount Athos is on about either. I get that the Slavs are ‘relative’ newcomers to that region, that Greek has been historically spoken there, now Slavic, but what does Mount Athos have to do with that? But then, I didn’t quite understand the earlier part of the historical explanation, where the US chap was saying it was the Germans who historically ‘glorified’ (my term) ancient Greece – trying to think who that would have been. Archeologists at Troy? It certainly happened as the American Revolution got underway, and your example of how many monuments are being privatized currently is rather ironic therefore, since they are national treasures. Dear heaven, Macedonia has quite a few of those itself, some lovely old monasteries. Back in the day, some of my church people visited, when it was still Yugoslavia. Yes indeed, provocateurs nobody needs. Let it be peaceful; Greeks have enough on their plate right now. There are people both on the right and on the left in Greece who prioritize opposition to NATO over solving ridiculous historical hangovers, and that of course fits in with geopolitical preferences, not to say needs, of Russia. DiEM25 does not differ substantially from SYRIZA when it comes to policy towards what used to be called (in Greece and at the UN) FYROM and now should be called North Macedonia. But the international media are not helping the non-nationalist politicians. Quite the opposite. They keep calling the place Macedonia. It is fine for Americans to be against NATO. And there are two ways of supporting Israel, an American way and a Russian way. Tsipras is more with the Russian way, I would say. By the way Wendy, I am an English native speaker. “In Moscow, Russian Foreign Minister Sergei Lavrov also questioned the “legitimacy” of FYROM’s name-change referendum, which is an effort to end a long-running row with Greece. “We do not oppose the name that has been proposed, we only question…the willingness of the United States to lead all Balkan states into NATO as soon as possible and to remove any Russian influence in this region,” he said. now putin/russia does have an informal military alliance w/ lebanon, but doesn’t want to piss off either turkey or israel by formalizing it. imo, it’s fine for anyone around the globe to be against both nato and africom, the largest purveyors of military violence around the globe. and yes, folks protest to their detriment. but the NYT fake news that (anonymous) pentagon aides were whispering that DT wanted out of nato, causing mueller’s team to open a counter-intelligence investigation into the traitor…took roots in the form of a new law to forestall any of *that* nonsense. and really, when he’d campaigned on the issue, all he’d really wanted was to get member nations to pony up their 2% of their gdp or whatever. so get to see peace candidate/congresswoman ocasio-cortez step on her brand again, lol. USian politics; my stars. the ‘progressive’ candidate for president is ‘conflicted’ about the use of torture, esp. for presidents with ‘ticking time bomb scenarios’ afoot. good gawd all-friday. oh, and juliania, i kno you’ll be interested in kiwi suzie dawson’s report on a new NZ five-eyes scandal. pretty much 2 L for me 2 read, though. can’t ike the title, never wanted to play that game on road trips as a kid on accountta that. suzie’s a staunch supporter of julian assange, you likely remember. but jacinda’s in davos…. Defence of Julian Assange is the indispensable common denominator. There can be disagreement over whether Israeli aggression is best countered by focusing on the politics of Israel in its own region or on the politics of Israel in the United States. In both cases the temptation will be to focus on the site that is furthest from where oneself is. And given that one has to, or should, form alliances in the first instance with people with whom can have comfortable relations of solidarity, frankness and equality, in Greece the choice on the left is SYRIZA/ DiEM or else KKE/Popular Unity. Would your choice be the same as it is now if you lived here, as a permanent resident? i’l agree that Defence of Julian Assange is the indispensable common denominator, but as to the rest of your paragraph, i find it convoluted at best, especially given ‘comfort and solidarity with dark heart bibi’. but oh, my, how we cheered tsipras’s win, and the OXI vote of his referendum against austerity forced by the troika.both here and when i wrote at the readers diaries at firedoglake earlier! i’ve been slowly working on a satire of the WEF in davos, it used to be an annual tradition for me. dunno if alexis will be there, but the financial pages say that his fractured ruling party is under consideration as a bad sign among the financial elite. peace to you, and to julian assange, impossible as the latter sounds. Wendy wrote: “to me, the issues of those both in FRYOM and greece who object to the prespes agreement are a bit akin to the crimeans who speak russian, in effect are russian, and wanted to be ‘stolen’ by russia. i had read a good essay on those in n. macedonia who dislike being hemmed in by language, passport ID as ‘macedonian’, culture, religion, etc….but of course i hadn’t grabbed the link, dagnabbit. There is a lot here that I really can’t make sense of Wendy. The North Macedonians and Greeks may be neighbours, but their cultural and linguistic differences have been at the epicentre of political conflict with a non-cultural and a non-linguistic basis. 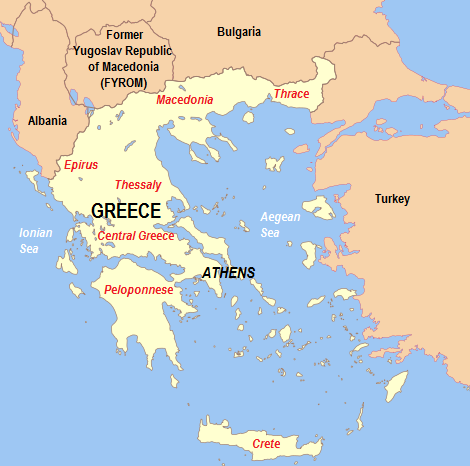 The Greek national state is incompatible with the conceptions of Balkan confederations that lie at the heart of the North Macedonians’ desires for their own identity. And appropriation of Alexander the Great is a kind of belated improvisation. The Balkan confederation idea was supported by Tito, the last of a series of figures who tried to make the idea a reality. It was at the heart of Communist ideas of what Macedonia should be. As for Brady Kiesling, I am surprised at your saying that he participated in a demo over North Macedonia. He is a pretty mainstream US Democrat. i was trying to encapsulate the page i’d found to that effect. it’s not my issue, but it is yours and keisling’s. and perhaps my analogy also failed, that’s fine. “US writer, lecturer and ex-diplomat Brady Kiesling cycled through the rally briefly though he didn’t take the pulse of the crowd. He was there before the tear gas was sprayed on to people. well, the MPs passed the bill w/ 153 yeas, no mention of oxis nor abstentions. “Brady Kiesling cycled through the crowd.” In other words he went there as a spectator. OK. That would be in character. It is a subject that has interested him for years. He is observing what is happening around a subject on which he is knowledgeable. He has always been more interested in monitoring the stupidities of his opponents than in doing something to make their activities more intelligent. Tsipras’ motivation for pursuing the Macedonia policy has not primarily been about currying favour with NATO, though it must certainly be a subsidiary motivation, encouraged by hopes of being able to survive politically in that way. on the left sidebar: Greek and Skopjian diaspora united in condemnation of Prespes agreement, and more of such. but you also gave tsipras a pass noting that fighting bibi from the inside is arguably the way to go, or something like that. we simply disagree. but aren’t you glad to know i wasn’t making it up? Wendy your views correspond to American national interests and I don’t want you to change them. Quite the opposite. Mainstream conceptions of what American national interests are should be eclipsed by your views. That is the desideratum, but it is your job, not mine. while your first sentence i baffling to me, please let me say that i am radically: anti-capitalist, anti-war, anti-imperialist (thus anti-nato and africom), and anti-likud (bibi) israel. on the other hand, this nation’s ‘interests’ are the polar opposite. may i ask that we move on from this thread soon? the one place you and i do agree is freedom for julian assange. i’d been trying to re-discover the timing of the march actions for assange in australia, and wsws did post them, although given what scott morrison’s said earlier, it’s hard to see them changing his mind. but miracles do happens, they say…. Yes, we can move on, but I am not happy about being inscrutable to you. I have Greek citizenship and want the Greek state to protect me if I need protection. Do you not make the same demand of your own state? But it seems your own state is more interested in interfering in the affairs of other states than in cleaning up its own internal affairs and in that way protecting you. my state would Never Protect Me; most of us who buck the system know that…in spades. please can we move on? Louis Farrakhan is doing more to undermine the warmongering Jewish lobby in the US than you are by fighting long-distance against Netanyahu. I don’t say that because I like Islamism or non-secular politics generally. i’ve been thinking about your request for creating a thread on ‘…so why is france still considered a great power?’ i’m not sure how we’d accomplish that save for your emailing me an essay of such, and i build it into a guest post. but that has one major draw-back: there are so few commenters here to read it. https://caucus99percent.com/ choose a screen name and avatar photo (maybe something iconically greek to spur extra interest? ), look at the Site Navigation menu on the far left of the bar, read FAQs, and then look at the top choice New Essay, grab one. there are some instructions, and style codes, etc. on the top menu bar, mainly self explanatory. now one limitation creating a diary (essay) there for me is that as it’s not a wordpress site (the café is), and i create my diaries in microsoft word with all the links, etc built in, & i can’t copy paste my diaries in and have the hyperlinks show up. it’s very frustrating to me then, that one must have to build the hyperlinks in on the New Essay page. even when i use the firefox easy copy that the site owner taught me, no longer do the internal hyperlinks show up, for some queer reason. now if i were to cross-post your guest post, in order to host the thread, you’d have to be registered, have a screen name, avatar image, in any event. anyhoo, those are my thoughts. The distinction between anti-semites and anti-zionists is something that as a disciple of Lenni Brenner I assimilated in my youth. Today as a refugee from Australia in Greece and in today’s world that is focused on national sovereignty vs globalization my theoretical focus has necessarily shifted. Farrakhan is both anti-semitic and anti-zionist but for all that he has produced (apparently) the most accurate analysis of the doings of the Jewish/Zionist lobby in the US. This is a disgrace because analyses of equal or greater value should be produced by people that are not thus stigmatized. As for the rest of what you say, I will consult my webmaster. Thanks for you interest which I appreciate, and that is an understatement. Two different subjects are getting mixed up here: Macedonia and Israel. Sorry. Now that in Europe the focus of interest is France and the movement is most developed there it might not be the time to remind the French that they owe their continued existence as a great nation to the generosity of the rest of Europe after the defeat of Napoleon. I would have started the discussion with this: http://main.cse-initiative.eu/?p=330 But what the hell, there are more urgent issues to discuss at this time. The rest of Europe is not setting any examples for France at the moment. do i take it that this is implying that’s an end to it? if so: d’accord..